Every now and then a book is released which becomes a spiritual classic–a book that brings people in touch with a distant world, opens minds to new possibilities and becomes standard reading for spiritual seekers. Autobiography of a Yogi and Be Here Now come to mind. 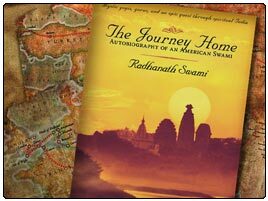 With the release of The Journey Home – Autobiography of an American Swami, I believe Radhanath Swami has given the world a new spiritual classic, one destined to both fascinate minds and touch the hearts of thousands. In recent memory, most presentations of bhakti that have arisen in the mainstream have been done by those not thoroughly seasoned in the practice itself. For instance, Deepa Mehta’s film Water and Elizabeth Gilbert’s book Eat, Pray, Love both have something interesting to offer, but neither can provide the appreciation of an insider. Therefore, I’m particularly delighted to see a presentation of bhakti-yoga enter the mainstream from a such a worthy practitioner.